I was just a little girl, perhaps about 7, when my memory was embedded with the intimate relations I had with my father, as a “mentor of struggle,” the day when he taught me to be generous and give away my teddy bear to a poor child instead of keeping it for myself. Such character turned into an ambition for me until I got acquainted with the PMOI/MEK. In those days, I used to help my father at home by folding the PMOI’s newspapers to speed up their distribution. Some times, I accompanied my father during his missions just to make things look normal. At the time, the PMOI’s activities had to be done secretly so that their whereabouts would not be exposed and I used to be the little fighter behind the scenes who assisted the frontline fighters! Shortly after, my father was called for a mission to Tehran. He promised me that upon his return, he would bring me a pair of compasses that I needed for my math class. Our house was attacked by guards while he was away. They brutally stormed in and broke all our cabinets, shelves, and furniture and inspected every inch of our house. I was only eight at the time but to this day, I can recall this scene quite accurately. The guards left our house after several hours but they remained in our neighborhood. That’s why we had to leave our home for our grandmother’s place. My father returned home to this scene and while the neighborhood was still under a siege. He quickly realized that the house was under surveillance so he got away as fast as possible, leaving his luggage at home. Fortunately, he was not captured by IRGC forces but the souvenir he had promised me was left behind in his luggage. That was the last time I saw my father but his advice was always with me. A few years passed and when I was a bit older I set up a satellite at home and received the PMOI’s TV channel (Simay-e Azadi). 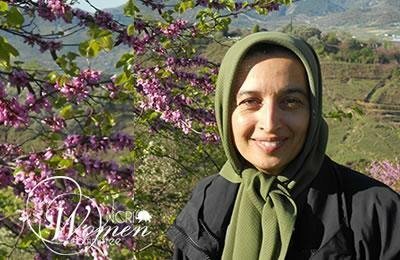 Through their programs, I got to know the PMOI women in a different light. They were collective, powerful, united and strong. Women who had chosen a great cause and had left their normal lives to join a movement that fought for freedom for all Iranian women. Like me, they had mothers, fathers, and families whom they had consciously and willingly put behind to concentrate with all their hearts and minds on a fight to overthrow the ruling regime. My decision to join the resistance movement coincided with watching one of the Resistance’s meetings held in July 1995 at London’s Earls Court. The voice within me told me that it was time to leave. It was time to join the vast sea, hand in hand with those fighting to overthrow the regime. I left home for what had become an honorable goal in my life. I crossed the border despite all the impediments and finally reached the PMOI in Ashraf. That’s where I saw my father after 15 years.